The Spanish Bay Bagpiper plays every day, rain or shine. The bagpiper begins on the first tee at The Links at Spanish Bay in front of STICKS, and finishes 45 minutes later at the Spanish Bay fire pits by the second green. During Daylight Saving Time, the bagpiper begins at approximately 5:45 p.m. During Standard Time, the bagpiper begins a half hour before sunset. 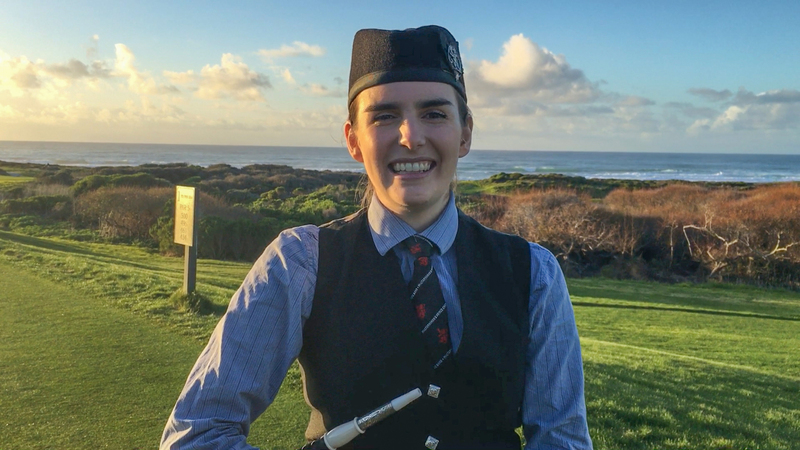 You aren’t the first clever guest to make those requests to Spanish Bay Bagpiper Lane Olson Driver, who has been strolling the rolling fairways at twilight for the last 10 years. We caught up with Lane, who shared her favorite stories from performing at Spanish Bay over the past decade. You can catch Lane and the rest of the Spanish Bay bagpipers a half hour before sunset during the winter months, and from 5:45 p.m. to 6:30 p.m. starting March 11. How did you become interested in the bagpipes? My mom plays the pipes as well. She’s been playing out here since Spanish Bay opened 30 years ago, so I grew up with it. My sister also plays the snare drums in a pipe band. I grew up going to the Highland Games. I was attracted to it from a young age. How long have you been playing at Spanish Bay? I was 14, so almost 10 years. I’ve been playing the bagpipes for 17 years. Are the bagpipes as difficult to play as they look? It’s definitely a physical effort. If I take a week off because I’m sick or I’m on vacation, I kind of notice it. It takes a lot of arm pumping and lip muscles. It’s a physical effort. How long can you play the bagpipes? I’m normally out at Spanish Bay for 45 minutes. I’ll usually play 10-minute intervals and medleys. I guess if I really wanted to, I could go for 20 or 30 minutes. But you can build up to it. What songs do you play during a performance at Spanish Bay? Technically they are called tunes, because there aren’t lyrics. I play a lot of different things the average person might not recognize, but I try to incorporate Scotland the Brave and We’re No Awa Tae Bide Awa – that’s kind of the quintessential bagpipe tune everyone knows. I play Amazing Grace. The most recent one that’s been the most recognized is The Skye Boat Song, which is played in the intro of the TV series Outlander, which takes place in Scotland. Everyone’s been recognizing that and getting excited. What makes a good bagpipes tune? The Highland Bagpipes only have nine notes, so it’s just one octave plus one note, so it’s a little bit limited that way. Probably my most requested tune is Danny Boy, which you can technically play, but it doesn’t sound that great. It’s a little flat, and you can’t get up to those beautiful high notes. I try to explain to people that it’s not really possible – plus it’s Irish, not Scottish. It’s a bit limited that way, but there are other tunes you can transpose to the pipes. Do you get a lot of requests? Most times I just get Happy Birthday. I get AC/DC a lot, or “Can you play Free Bird?” but I can’t really do that. 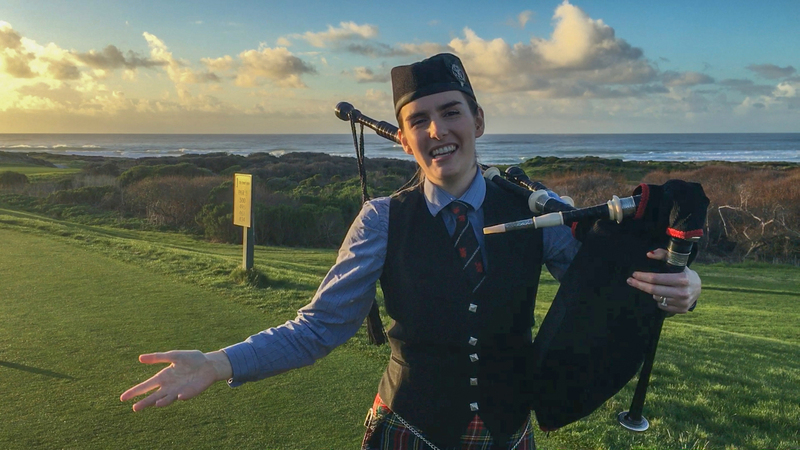 Do you have a favorite experience playing the bagpipes at Spanish Bay? A few years ago, a man introduced himself at the Roy’s Patio. He said his name was Jens Lindemann. His friend told me, “You don’t even know who this guys is. He’s a world-famous trumpet player.” Jens was telling me how much he loved my performance and that I was a wonderful player. He couldn’t believe how much people were talking when I was playing. I don’t really mind, I think it’s more of an ambiance thing. He asked if I could stay and have a drink, and unfortunately, I couldn’t, but he then asked, “Can I honor you by playing Danny Boy on my trumpet that I have with me?” So he played this little rally noise on his trumpet and got the whole patio’s attention, and said, “I want to introduce you to Lane Olson, she was our bagpiper tonight and I think she was great. I want to honor her by playing Danny Boy.” It was an unforgettable experience. It was great. A lot of times people will think I’m a guy until I am up close and walk by them. Then they get excited. It’s a little bit rarer. I’ll get questions like, “Oh, are you wearing anything under that kilt?” I kind of leave that to the men. I’m not really into that with the wind and everything. Silly questions like that. But it’s a lot of fun. You meet a lot of great people.